See more Dorothee Schumacher Mid-length skirts. We check over 450 stores daily and we last saw this product for $362 at Dorothee Schumacher. 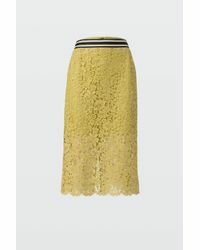 This knee-length pencil skirt is a romantic favourite piece with modern details. The filigree guipure lace is adeptly offset by the sporty tape details on the waistband. 60% cotton, 24% polyamide, 16% viscose. Lining 60% acetate, 40% viscose. Skirt in guipure lace. Sporty tape details on the waistband. Pencil silhouette. Knee-caressing length. Colour-coordinated lining. Very mild fine wash, wool-silk cycle. Cold wash, no hand wash. The BOLD POETRY skirt is close-fitting. Our Model is 1,80m and wears a size 2. Measurement in size 2: Length (front): 69,5cm. 1/2 hip: 48,5cm.